Are you ready for one of the best DIY costumes you’ll every lay eyes on? PREDATOR! The likeness is mind-blowing. See the outrageous step by step process of this costume creation here. This entry was posted on October 17, 2014 at 7:44 pm and is filed under craft, halloween, sci-fi with tags craft, halloween, sci-fi. You can follow any responses to this entry through the RSS 2.0 feed. You can leave a response, or trackback from your own site. This is so good it looks like a figurine! If it wasn’t for his canine companion in the corner I would not have a sense of scale. 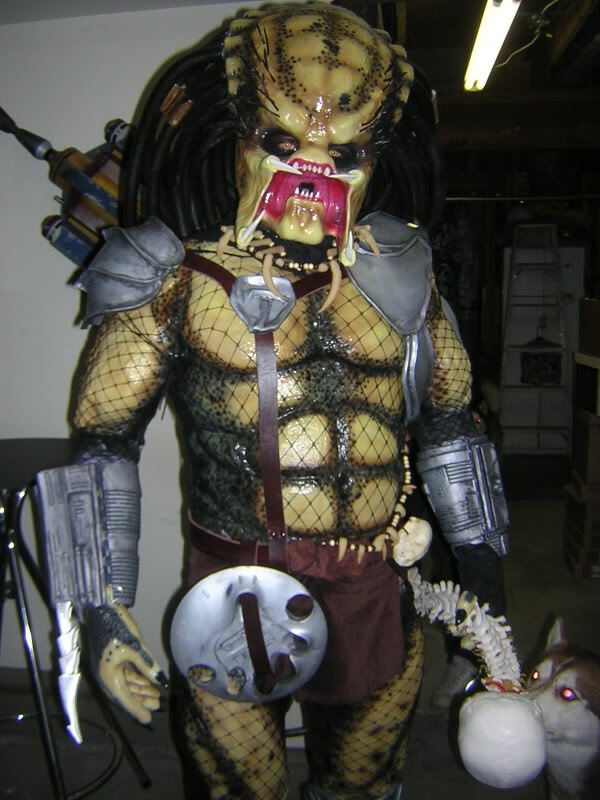 There used to be a Predator replica at a store here in LA. It looked just like this. I think I have a pic of me with it somewhere. I like the Predator’s doggie in the corner of the photo! Isn’t it great that they eyes are glowing red, too? I thought that was a fake spooky dog! I read the how to. It says he had his friend cover him in duct tape over tight clothes to make his own body double. Next he had to be extracted–I guess the friend also is the one who “cut off the duct tape and the clothes it’s attached to.” Hey–when your friends cut off your clothes for the sake of a costume, I hope they are Really Good friends!